We are delighted to announce the launch of most awaited e-CAM130_CUXVR, Synchronized multiple 4K cameras for NVIDIA® Jetson AGX Xavier. 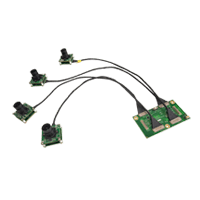 e-CAM130_CUXVR is a multiple camera solution that has upto four 13MP 4-Lane MIPI CSI-2 camera module based on AR1335 image sensor from ON Semiconductor. You could opt to purchase anything between single camera to four cameras as per your requirement.